A Game of Thrones History Lesson: Different Species, Ethnicities, and Races in Westeros and Essos -- Part 2 – AiPT! It’s time for another Game of Thrones history lesson to sate your thirst for the upcoming season four. Last time around we went over the Children of the Forest, the Whitewalkers, the First Men, and more. A Note on Spoilers: There will be no spoilers past Season 3 in terms of plot, so feel free to read the following without fear of ruining the tension of the show. If you recall from the last post, things went well for the Children of the Forest before the First Men showed up with bronze weapons and horses. After a long war that saw the destruction of the Arm of Dorne and the flooding of the Neck, the Children and First Men set down and made a treaty. Anyway, the First Men and Children had to face the perilous Others, a demon race known in the show as the “white walkers.” After nearly being destroyed, they managed to push them back and put up a Wall to keep the Others from attacking again. Thousands of years later, another ethnicity of people called the Andals came from Essos. They landed in the Vale and burned the weirwoods and killed the children south of the neck. Using steel weapons, they soon conquered the lower kingdoms, but could not conquer the North. That brings us to where we are today, where I will talk about the last race of people to inhabit Westeros, the Rhyonar, and then briefly mention a few different types of people in present-day Westeros. The Rhoynar were a group of people that lived along the Rhoyne River in western/central Essos. 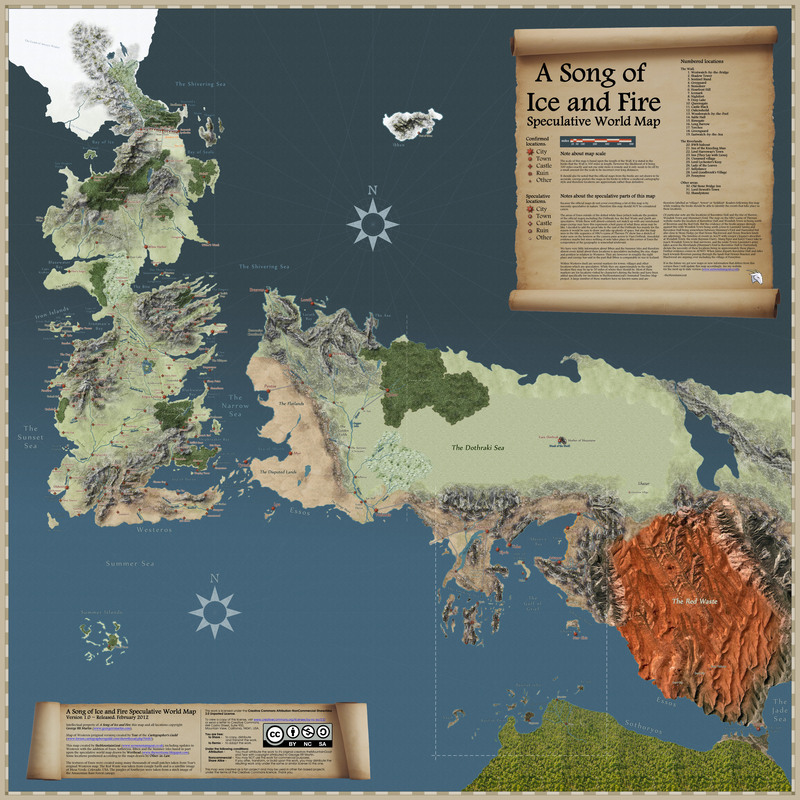 The reason they left Essos involves a war with the ancient Valyrian Empire (we’ll get to Valyria and Ghis next week). After Prince Garin led over a quarter of a million Rhoynar to the death to fight the Valyrian expansion, the warrior-queen Nymeria (Arya’s wolf’s namesake) united the Rhoyne cities and brought them across the Narrow Sea via Dorne (the same way the First Men came). This was around 1,000 years before the start of the series, 700 years before Aegon’s landing. The Rhoynar were a slender people with olive skin, black hair, and a smooth complexion. After leading a great Rhoynish exodus from Essos, Nymeria married a Dornish lord, Mors Martell of Sunspear, and helped him to consolidate Dorne under his rule. To this day, their descendants, the Martells, rule Dorne from Sunspear. Doran Martell is the current lord. The people of Dorne are descendant of the Rhoynar more than that Andals, and most are visibly different from descendants of Andals and First Men due to their olive skin. Anyway, Mors Martell became the first King of Dorne, and the Martells remain the lords of Dorne to this day. Culturally, the Rhoynish are separate from the Andals and First Men. The Rhoynish are egalitarian in inheritance. An older daughter will come before a son in the lineage. Thus, Dorne would have ruling Queens as often as Kings. To this day, Dornish law says that an older daughter comes before a son, and Dornish law rules in Dorne. In Essos, the Rhoynish worshipped gods of the river. After moving to Essos, most converted to the Faith of the Seven, although some did not. The “orphans of Greensblood” live on rafts and sail along the Greensblood River and consider themselves orphaned by the Rhoyne. They still worship those gods. And now onto present day Westeros and the different types of people. I’ll start with what might be the most familiar to non-book readers. The Ironborn are descendants of the First Men. When the First Men assimilated with the Children and took on their gods, the Ironborn did not. They worship the Drowned God, whose natural enemy is the Storm God. The King of the Iron Islands sits on the Seastone Chair, which I believe I mentioned last week as “the Iron Throne of the Isles.” Even after Andals took over the mainland, the majority of the Ironborn stayed true to the Drowned God, with only a few converting to the Faith of the Seven. The Ironborn are pirates and raiders. Their Old Way came from this lifestyle, which emphasizes strength and praises the skilled raiders. It’s why Theon buying jewelry was considered weak of him; he should have “paid the iron price” (raid/steal) rather than the gold price. During raids, the Ironborn would take captives who worked on farms. Women were taken as salt wives, concubines for the man. A man would only have one “rock wife,” a true Ironborn wife to give him his trueborn sons. Another group you’re all familiar with. The wildlings, like the Northmen, are descendants of the First Men, but they were north of where the Wall was put up after the War with the Others. The “free folk” were untouched by the feudal system that developed south of the Wall, and were never conquered by Aegon. The wildlings are hard to group together, as their customs differ from village to village. They speak either the Old Tongue of the First Men or the Common Tongue that the Andals brought over. The law is isn’t anything like it is below the Wall. People protect what they have. The wildlings are a hard people because of this—the weak don’t survive. 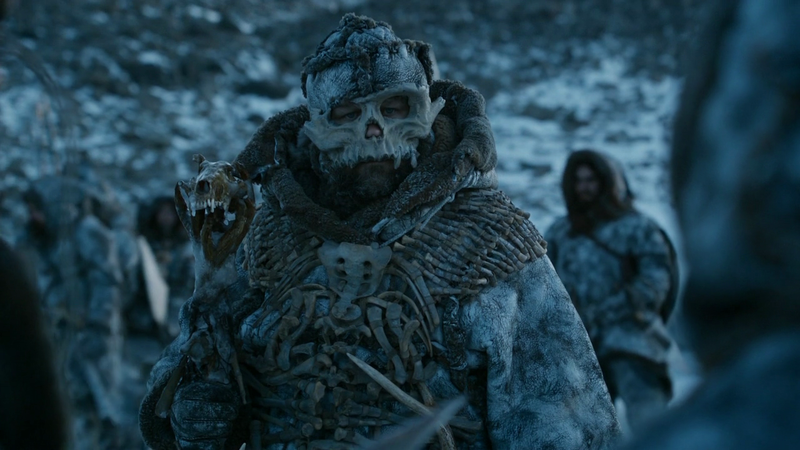 I could probably do a whole topic on the different wildlings. Some cultural tidbits: Spearwives are women who choose to fight alongside a specific man. They are considered as tough as the man is. For instance, Ygritte has become Jon’s spearwife. Marriage isn’t so much a ceremony for the wildlings. A man is supposed to steal his woman of another tribe from her home (a daughter, not a wife), and the farther he goes to get his woman equates to the more he cares about his clan. Because of high infancy mortality rates, it is considered bad luck to name an infant before two years old. The wildlings often raid beyond the Wall, and it isn’t that hard for a small group of wildlings to make it south. Six times there have been Kings Beyond the Wall, all of whom have tried to go south and all of whom fail in different, interesting ways. I might talk about each of their attempts, because there are some great stories. The wildlings were in direct contact with the Children when they fled from the Seven Kingdoms. The Children passed along the ability of greenseeing (Bran and Jojen have it, makes them able to see things in the past, present, future) and warging (putting one’s consciousness into the consciousness of animals). Mance Rayder is the current King-Beyond-the-Wall. He’s the son of wildlings, taken in by the Night’s Watch. He was raised as a crow but soon defected to the wildlings and amassed a large following, uniting the different wildling tribes and cultures into one army. The people of the Neck are called Crannogmen. The Neck has been sworn to House Stark and considered part of the North since a King in the North killed a marsh king and married his daughter. The Neck was flooded by the Children in their war with the First Men, and is thus a collection of swamps and bogs. They are ruled by House Reed of Greywater Watch. GW is a mobile castle that moves throughout the marshlands. Howland Reed, the current lord, was a good friend to Ned Stark in Robert’s Rebellion, and his children Jojen and Meera are currently with Bran, Rickon, etc. The crannogmen live off the land, usually by fishing and frogging. They are good hunters, and in war they resort to guerrilla tactics to win. Thus, they are looked down upon by most Westerosi as dishonorable savages. To go through the Neck without being led by the crannogmen, you must go on the Kingsroad. It is high above the marshes, and is a long and slow march for any army. Moat Cailin, the “impregnable” castle that protects the North (where the Children stopped the First Men and the First Men stopped the Andals) faces the marshes. Thus, an attack on Moat Cailin involves a knowledge of the land, and thus cooperation with the crannogmen. They have a long feud with House Frey (the ones who Robb was betrothed to marry into, Edmure). The Mountain Clans of the Vale were first seen in Season 1 when they joined Tyrion and Bronn on the way back from the Eyrie. There are various tribes that are in constant conflict that prey on the weak who travel through the mountains. The Northern Mountain tribes live in the mountains near the Wall and are considered distinct from the Vale’s mountain tribes. They have inhabited these mountains for thousands of years. There are forty tribes in the north in total. Although they are not lords, the chiefs of the tribes are considered as such by their liege lords in Winterfell. Because they call the chief of the Wulls “The Wull” and the chief of the Harclays “The Harclay”, etc., they would call Lord Eddard Stark “The Ned.” They have a lot of respect for the Starks, and some even rode south with Robb in the War of Five Kings. Thirsty for more Game of Thrones History Lessons?